The 9501-DCDA-3G provides 3G/HD-to-SD down-conversion with ARC and has versatility in providing up to four SD-SDI and/or analog composite outputs as well as up to four reclocked SDI input copies. 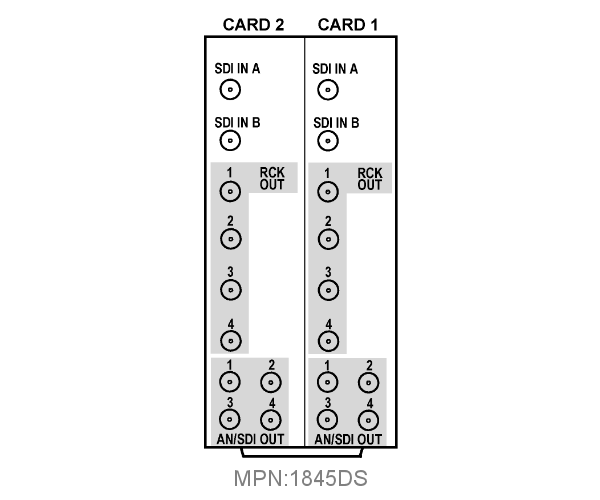 The space-saving design of the 9501-DCDA-3G provides for high density, allowing two cards to be collocated in adjacent slots and served by a single, standard width “split” rear module. 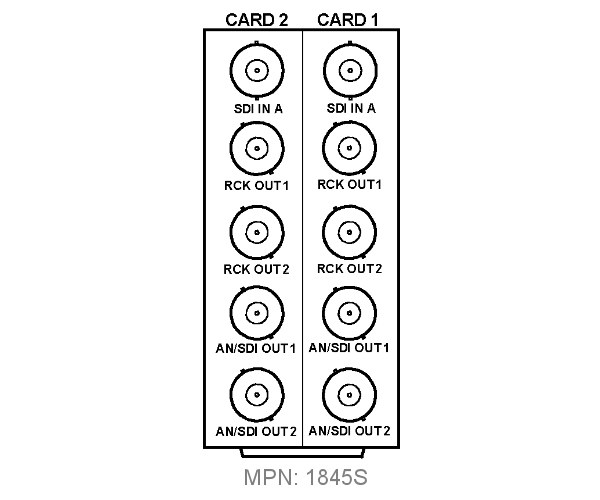 Up to 20 of the 9501-DCDA cards can be installed in a 20-slot frame. The card can pass SD signals with re-aspect, if needed. AFD processing can detect an incoming AFD code and correspondingly set scaling to track with AFD. 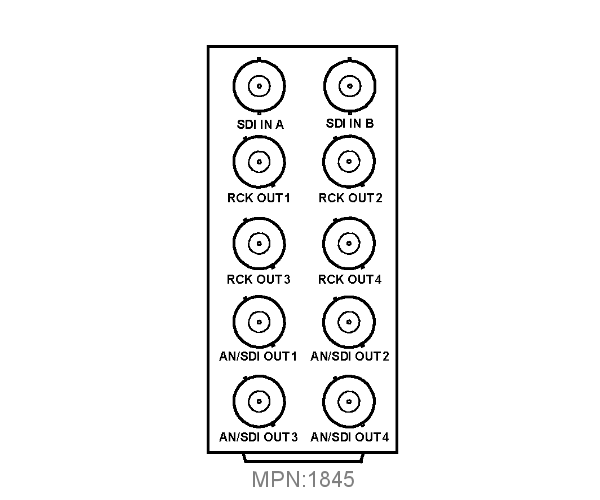 This processor also allows independent custom ARC to be applied for each incoming AFD code, and set the desired AFD code to be inserted on the output, even if there is no code detected on the input. 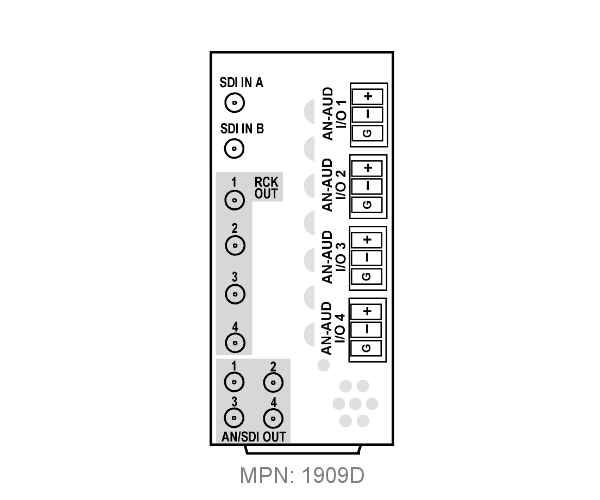 Analog audio outputs can be de-embedded from selected embedded audio channels. The 9501-DCDA can rate-convert 23.98 frame video to 59.94 fields, move progressive to interlace and is equipped with extensive user programmable reticule overlays. Two discrete character burn strings can be inserted on output video, with each string inserted as static text and/or insert only upon LOS. The data path is 10-bit with 12-bit analog encoding. Full proc control allows adjustment of luma gain, luma lift, color gain, and color phase. Preset save/load allows saving custom card settings while allowing one-button revert to factory settings. Preset save/load allows saving custom card settings while allowing one-button revert to factory settings. Layered presets allow invoking changes related only to a specific area of concern (audio routing, for example) while not changing any other processing settings or aspects. Full user DashBoard™ or Remote Control Panel remote control allows full status and control access over a standard Ethernet network. Economical solution for 3G/HD down-conversion to legacy SD monitoring systems. HD version further economizes for environments requiring only HD/SD support (field upgradeable to 3G with software license upload if later desired). Full timecode and CEA 708 / CEA 608 conversion to SD VITC timecode and closed-captioning. Option +LTC allows bidirectional transfer between embedded video timecode formats and audio LTC. 3G Software Option Upgrade Option (+3G) – Upgrades 9501-DCDA-HD card to 9501-DCDA-3G functionality/specifications. Color Correction Option (+COLOR) – Provides independent RGB channel controls for luma, black, and gamma. Ultra-fast response time. The color correction feature is perfectly suited for use with Cobalt OGCP-9000/CC Remote Control Panel. Frame Sync Software Option (+FS) – Adds frame sync to 9501-DCDA-3G card. Provides full vertical and horizontal offset and frame delay controls. Glitch-free handling of embedded audio when a frame is dropped or duplicated. Audio LTC I/O Option (+LTC) – Offers bidirectional transfer and conversion between video timecode formats and audio LTC. Audio LTC can be received or sent over various card audio channels. Number of Inputs: (2) 3G/HD/SD-SDI BNCs. GUI-selectable. Number of Outputs: 4 dedicated reclocked output BNCs. 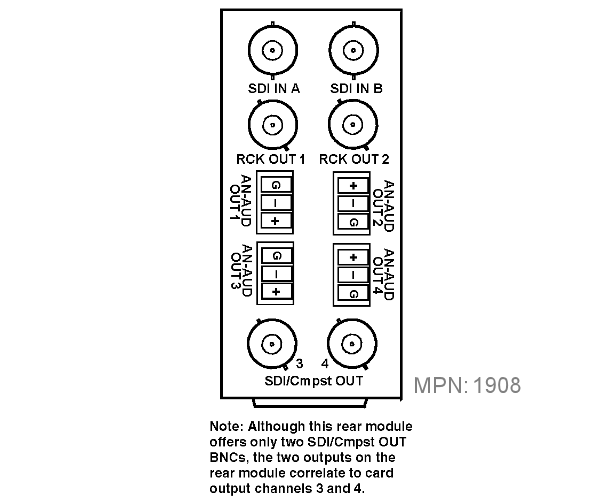 Up to 4 processed SD-SDI (or CVBS output) BNCs. GUI-selectable. +3G Software license upgrade for 9501-DCDA-HD card. Upgrades card to 9501-DCDA-3G functionality/specifications. You are currently requesting a quote for 9501-DCDA-3G.